It normally sells for $149. Even when it goes on sale it never gets anywhere close to that low so it’s a bit perplexing. The really strange thing is Amazon isn’t even advertising it as being on sale. They’re making it seem like $79 is the new starting price, but so far there’s been no announcement made about it. It could be a pricing error, but the new price is mentioned everywhere, even on Amazon’s homepage, so that doesn’t seem very likely. Perhaps they just haven’t started promoting the deal yet. 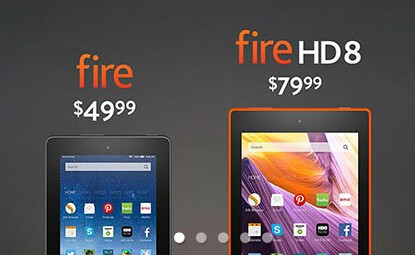 Either way, $79 is a great price for the Fire HD 8. Here’s my Fire HD 8 review from when it was first released. As the name suggests, the Fire HD 8 has an 8-inch screen with a resolution of 1280 x 800 (189 ppi). It’s one of the new models that was released in 2015. It’s quite a bit nicer than the $49 Fire. Here’s my comparison: $49 Fire Tablet vs Fire HD 8 Comparison Review. Now that it’s only $30 more the decision is a lot better in its favor. The 8GB model is $79 and the 16GB model is $99. Both have microSD card slots, dual speakers, front and rear cameras, quad-core processors, Bluetooth and WiFi. They run Fire OS 5, and Google Play can be installed quite easily. There are four color choices: black, magenta, blue, and tangerine. Update: It must’ve been a pricing error after all because now it’s back to $149 after just a few hours. Update #3: A few hours later and it’s back to $149 again. What is going on? Update #4: So on Monday morning it was back to $79 again for 8GB and $99 for 16GB, but the prices only lasted for a few hours before going back to $149 and $169. Something strange is definitely going on… Will it happen again tomorrow? That is a great deal. The 16GB version is $20 more, still only $99, and the must have version due to the way Amazon stores their content (books, movies) on the in device memory instead of the expandable memory card. Downloaded Google Play to mine thanks to Nathan’s article, so am well pleased with mine. Must have been a fire sale. I don’t see it at the discounted price anymore. Yep, somebody must’ve screwed up after all. It did seem too good to be true. It is back to $149. When I saw the price, I ordered right away. I knew the price would not last. I am excited, got the 16 GB tangerine. My birthday is next month, so I will save it. What is wrong with them? It’s just like yesterday except now it says $99 everywhere instead of $79 (and up of course). Maybe they’re clearing out inventory? Trying to see how sales are at different price points? Feb 22 morning: It is 79.99 again for 8G and 99.99 for 16G. It seems like it is on sale daily in the morning. Very strange. If someone owns it, can you tell us if we should spend the extra $20 for the 16G version? Is it true the micro sd card can’t store Kindle ebooks? Thanks! Most people would definitely tell you that it’s worth it because not everything can be saved to the card, including Kindle books, audiobooks, and some other things. Or if you’re using profiles; I hear a lot of people complaining about their 8GB kid’s tablets running out of storage space too fast. I do feel it is worth the extra to get the larger 16 GB version. I ordered mine 2 days ago. For most people, the 16 GB is the better choice. Just bought mine HD 8 16gb for $99, February 23, 2016 @ 7:30pm PST. Just checked at 10:40 PM, back at $79. Ah, they’re going for an evening sale this time. I figured they’d finally given up on it today but they were just holding out.